When you roam the hallways of the American Gem Society, it’s not unusual to see members of the team staring at images of gorgeous jewelry on their desktop. We work in this industry because we are fans of shiny, pretty things! As jewelry lovers, we can be a little fickle, month to month, as to what our favorite gemstone is. Yes, we love diamonds. Quite a lot. Turns out, we love May’s birthstone quite a lot, too: the emerald. Pair an emerald and a diamond together, and we pretty much have a hard time finding the words to describe how over-the-top in love we are with that striking combination. But let’s try. And in the process, we’ll show you some of our favorite pieces of emerald and diamond jewelry. First, a little history on the emerald. This beautiful gemstone was mined in Egypt as early as 330 BC, but some estimate that the oldest emeralds are 2.97 billion years old. Cleopatra had a thing for emeralds. She even claimed ownership of all emerald mines in Egypt during her reign. If the queen could be around today, she would no doubt attempt to expand her reach of this green gift from the earth. Emeralds, like diamonds, are analyzed according to the 4Cs: color, cut, clarity and carat weight. Rare emeralds are a deep green-blue, while lighter colored gems are more common—and a good choice for those looking for a more affordable alternative. Now for the good stuff: take a look at this stunning pendant below from JB Star. 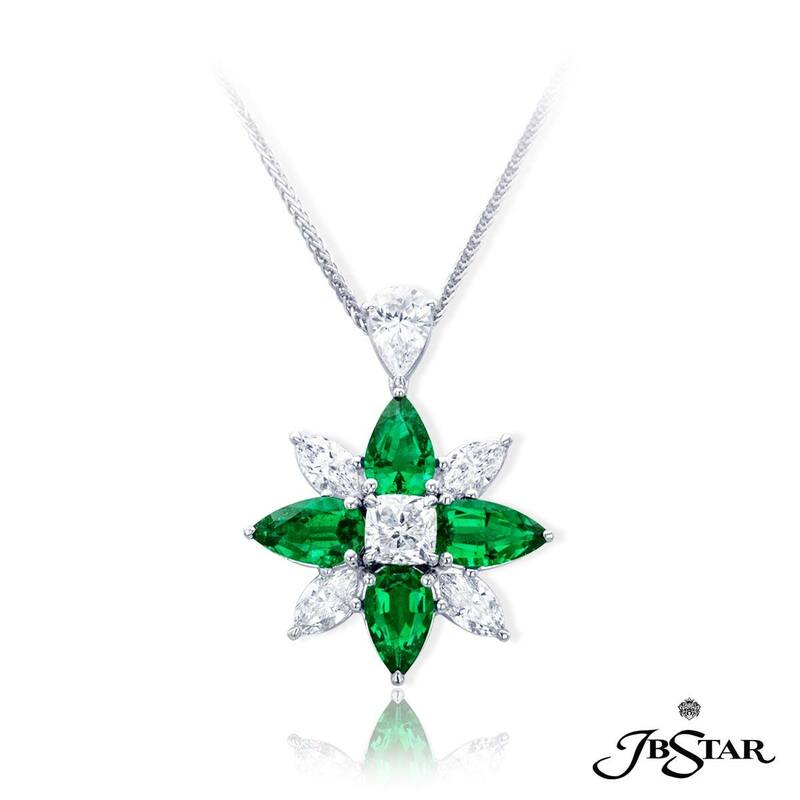 Marquis shaped emeralds and diamonds surround a square-cut center diamond for a green and white starburst. 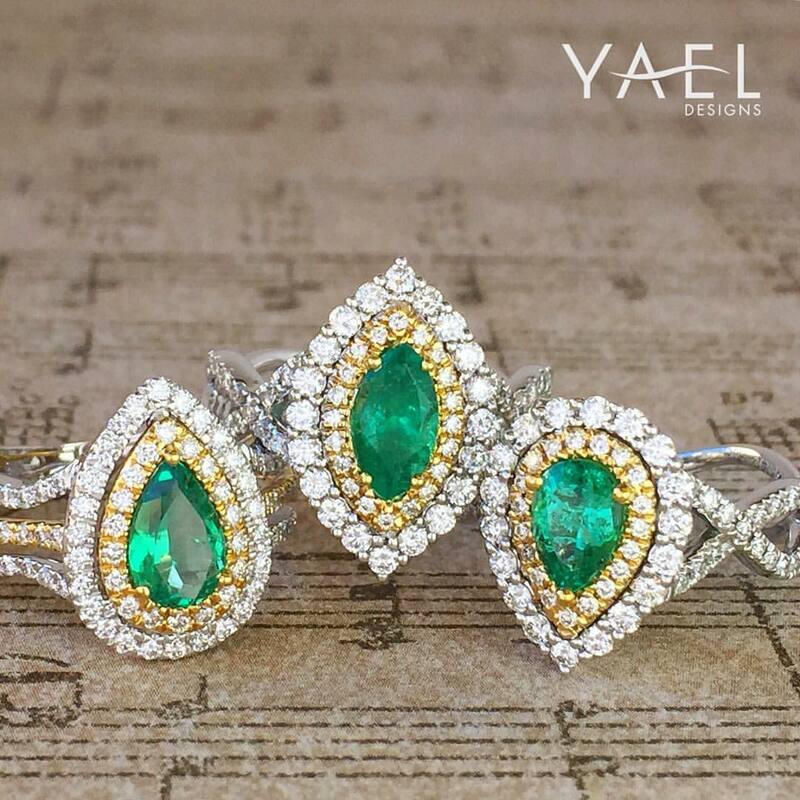 Yael Designs is known for creating crazy beautiful colorful jewelry. Here, they show us some marquis magic, blending yellow and white diamonds with emeralds. 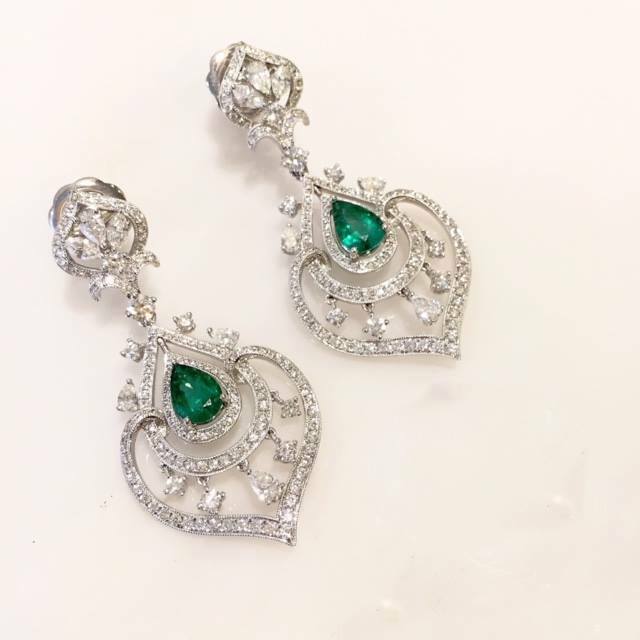 Supreme Jewelry created this gorgeous pair of diamond chandelier earrings featuring tear-drop shaped emeralds. There is quite a lot to love here. Especially the intricate yet delicate design. Try to imagine this design with another gem in it other than emerald. Would it have the same level of vibrancy? Jewelry can represent different things: symbols of love and success, a cause for celebration, a little something extra to make you feel good. If you are in search of fine jewelry, whether it’s an emerald, diamond or another gemstone, shop with a jeweler you trust. It’s step number one in the jewelry-buying process. Find a professional, trusted American Gem Society jeweler here. To learn more about emeralds and diamonds, click here.